Frank Carey is a name well known to aviation historians. As an NCO pilot, before the war finally erupted into action in May 1940, Carey had already been in combat and received the DFM. Commissioned just before 'the balloon went up', he was sent to France and fought doggedly for four days, shooting down more than a dozen German aircraft and winning the DFC and Bar. He then returned to England and the Battle of Britain, scoring 18 by mid-August 1940, all on Hurricanes, before being wounded. In 1941, he was given his own squadron, with which he sailed for the Middle East, then onto Rangoon, Burma to fight the Japanese. 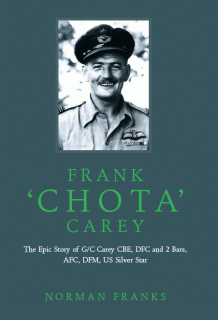 Fighting a desperate rearguard action as the British army retreated up Malaya, and then Burma, Carey shot down more hostile aircraft and had further commands in India and Burma, having gained the nickname 'Chota' because of his size. Ending the war as a Group Captain, he later had an illustrious post-war career in the service, including becoming Air Advisor to the UK High Commissioner in Australia and Rolls-Royce Representative in the same country. Of the top twelve British aces of the war, Carey's long-awaited story is the only one so far not to have been produced as a book, due mainly to his own self-effacing modesty. Norman Franks was given full access to private papers, log books and archives and had the pleasure of meeting Frank on several occasions. This is a warm and rewarding study by a renowned historian. A highly recommended read and "must have" in any collection. The book is in very good condition with nice tight and clean pages.